Multi Media LLC | What is a fan club membership? Home › Fan clubs › What is a fan club membership? Fan clubs are a great way for members to support their favorite broadcasters! Subscribe to your favorite broadcaster's fan club. As a fan club member, you will be seen with a green username in chat, and you will receive free access to all of your favorite broadcasters' Fan Club Exclusive Content. There is no limit to how many fan clubs you can join. You can easily cancel a fan club by clicking "My Profile" on the top right of the site, and going to the "Memberships" tab. You can enable fan clubs under the "Settings & Privacy" tab. You can select your fan club settings and invite members that view your broadcasts to join your fan club. Your fans will be easy to identify in chat with their new green usernames. 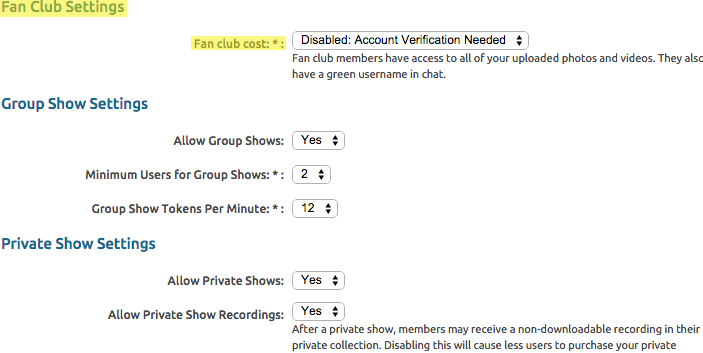 To start your fan club, go to the "Broadcast Yourself" page and click "Settings & Privacy" and select a price point that you want to charge to join.